Physical health is not concerned with the preservationand promotion a child’s health, but also health saving technologies. Hardening,massage, air bathtubs, immunization, and prophylaxis of diseases are all inthis category. A very important part of this direction is the formation ofcultural and hygienic skills (keeping of a daily regimen, washing hands beforeeating, and so forth). You shouldn't forget about physical activity either:charging, dances, mobility, and sports or acquaintance to different types ofsport. Where there are sports, there is a healthy lifestyle. Since three yearsit is already possible to acquaint the kid with Healthy life-style in a playfulway. It is necessary to help frame the child an integrated idea of the body, toteach "to listen" and "hear" his body, to learn the skillsof first aid, and to cultivate an ability to sympathize with another’s pain. Art and esthetic development means education of the esthetictastes of children. Acquaint a child with the world around, emphasizing hisbeauty and uniqueness. Admire, rejoice, and be proud together with him. Theemotions cause the aspiration to transfer the seen beauty, to imprint that waspleasant to the child. 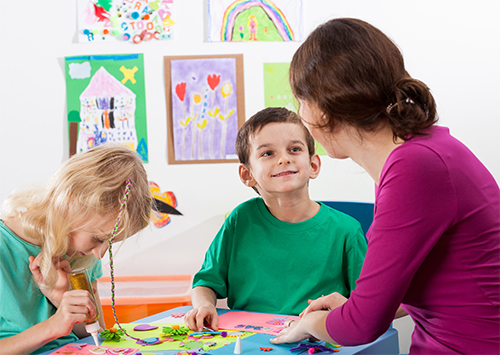 At this stage, help the child with creative activitiesand self-expression: drawing, molding, designing, music, theater, and subjectrole-playing games will help you develop creative abilities and imagination. In the social and personal development of the child,special attention is paid to the development of the identity and social skillsof the child. Acquaint the kid with the culture of communication, behavior insociety, and the permission of problem situations. Teach the child mutualaid and empathy. Also don't forget to praise, support, and stimulatethe kid in any activity. Such relation promotes formation of the child'spositive feeling, confidence, and independence in decision-making andresponsibility.